It’s OVER. (Summer). Hate to break it to ya. (Unless you’re in Oz in which case it’s just beginning). But let’s look on the bright, bronzey side. 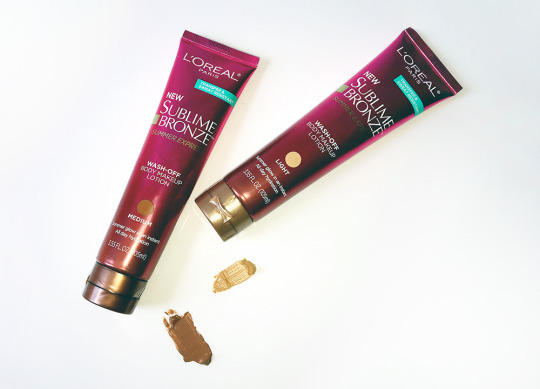 Sublime Bronze Summer Express Wash-Off Body Makeup Lotion is one of those products I majorly gave the side eye. How could bronzing body makeup actually be workable in real life, vs. in a music video? But I was very, very surprised. This stuff creates an even, streak-free sunless tan. The sweat resistant formula also gives hydration, and creates amazing evenness without looking unnatural. It’s not a self-tanner - so it does wash off with soap and water. It comes in a range of shades - the light (which is what I used) actually looks almost like foundation, but that’s what you want if you’re looking for glow vs. fake. If you have an event or want to generally extend the event that is summer … we co-sign.